Print quickly - they may go fast! 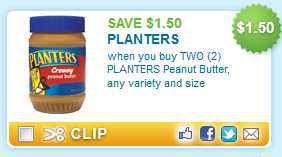 Look for Planter’s Peanut Butter at Walmart for $1.98 each. With the coupon - you pay $1.23 each! The coupon expires 30 days from the time you print it, so you could hold on to the coupon until a really good sale comes along! How can it be used on Nuts or Trail Mix when the coupons states it is for Peanut Butter ? Oops! I read it wrong, I was thinking it says any Planters product. These offer is exciting to see hope we can get more items in future.